This post is an extension of my previous post, How to Make a Flip Cover. 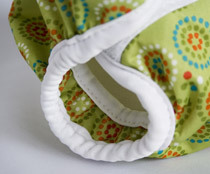 Cloth diapers can come with a variety of special features. Some are just for fun, like ruffles and applique designs. Some are much more practical, like leg gussets. Leg gussets...not just for decoration! Leg gussets add an extra wall of defense for extreme baby messes (especially for sloppy newborn poops!). They are quite easy to add to a flip cover. You just need one more small piece of material for each gusset, cut in a long, half-oval shape. In order to have an appropriate sized gusset for your diaper, measure a straight line between the leg elastic markings on your pattern. This will be the length of the straightedge on your gusset. Then, at the center of your straightedge, measure a perpendicular line that extends 1.5 or 2 inches (for a size small or large diaper, respectively). Last, draw a shallow curve from the extending line to the ends of your straightedge. This is your gusset piece. You will also need another piece of fold-over elastic (FOE) for the gusset. To cut the FOE to the right size, stretch it out until it very nearly reaches its maximum length. Cut it so that it is the length of your gusset straightedge while it is extended. I should also mention that I like using a narrower FOE for gussets (I used 5/8 inch FOE for the gusset, while I normally use 1 inch FOE for the rest of the cover). Next, sandwich the gusset straightedge inside your stretched-out FOE, and sew the layers together. When the elastic returns to its normal length, the gusset fabric will be gathered. Now it's time to attach the curved side of your gusset to the rest of your main flip cover. With the urethane (waterproof) sides of your fabric facing each other, sew the two pieces together. You should line up the end of your gusset with the elastic marking on your main cover piece. Don't worry if it doesn't look very pretty at this point. It will all be covered up by 1 inch FOE during the rest of your construction. Finally, you sew the 1-inch FOE onto the cover, following the same path that I described in my previous post. You just have to be careful that your gusset is tucked away, safely out of the reach of your sewing machine needle. 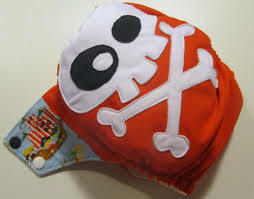 The red diaper in the pictures was ordered by a college friend for her cousin. Although Jadon does not have any diapers with gussets right now, he had a few when he was younger. 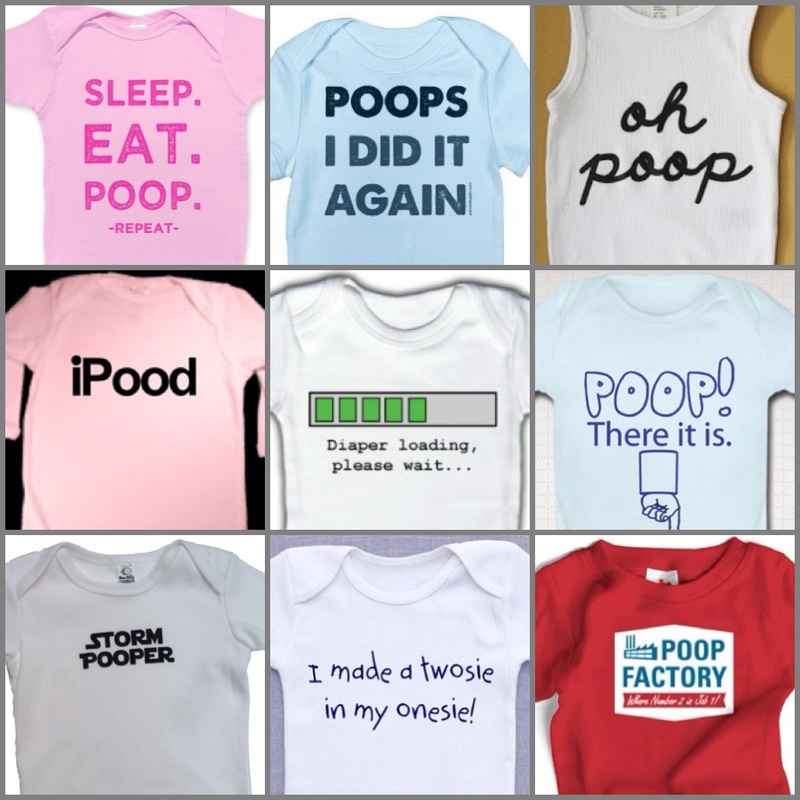 Truth be told, he has never had a poop explosion that has escaped a cloth diaper, gussets or not. So, Jadon doesn't seem to need gussets on his diapers. ...maybe you need to order some diapers from me...with gussets! I'm a mom who is still a little dancer at heart, trying to live a healthy and resourceful life with my husband and three kids in a two bedroom duplex. This blog is a record of my creative efforts. The music's always playing at our place, so if you can feel the beat, join right in! 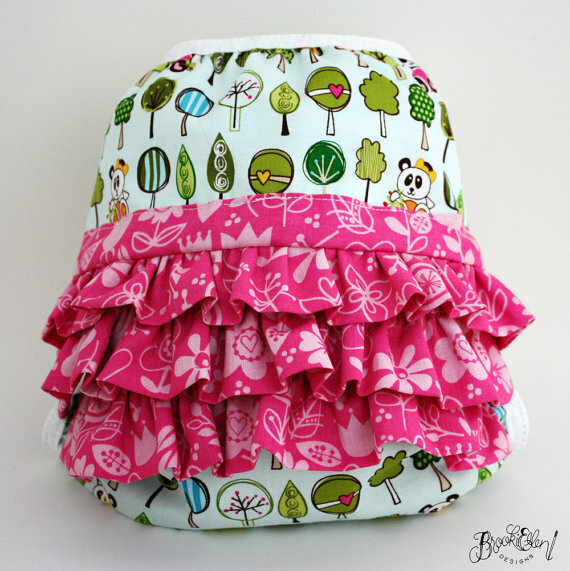 Cloth Diapers for Mama? Mama Cloth! Cloth Wipes: New and Improved!